The goal of elective surgical repair of ascending aortic aneurysms is to prevent catastrophic aortic dissection and rupture. The timing of elective surgical repair for ascending aortic aneurysms is based on measurements of aortic diameter. The general threshold of 5.5cm is based on the observation that the incidence of aortic dissection and rupture rises significantly as aortic diameter approaches 6.0 cm or more. 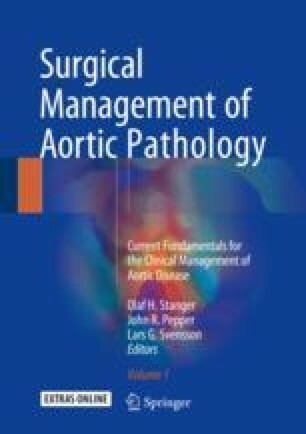 A variety of syndromic and non-syndromic connective tissue conditions predispose to aortic dissection and rupture at a smaller diameter. Identification of patients with these disorders is important as the aortic diameter threshold for recommending surgical repair must be lower than 5.5 cm. For an individual patient we must balance the risk of surgical repair, which is relatively low in experienced centers, against the risks of catastrophic dissection and rupture.